The FordEx 300lm Mini Cree LED flashlight is a good buy because from the original retail price, it is now being sold less than the original price. The product has been discontinued and so what is being sold online are either knock-offs or the last of the genuine items. There has been more good feedback than complaints. Of the complaints, the most common is about the battery which does is specific. In addition, shipping can take a long time if you buy from the Chinese retailer. Amazon, on the other hand, delivers within days. The Chinese version also has slight differences from the ones being sold on Amazon such as the mode/function switch. Overall though, this tiny flashlight gets a 4.5 star rating. The FordEx 300lm Mini Cree LED flashlight is a 7 watt, adjustable focus with zoom where the flashlight head can be pulled to adjust the beam and zoom. It’s a super mini flashlight known for its blinding light, water resistant and skid-proof design. It is not waterproof and can only be given an IP rating of about IP51. This is because there are some leaking issues with the sliding focus head. The maximum lumen for this flashlight is 300 and it is accepts AA alkaline, lithium 14500, and NiMH batteries. Some customers have complained that the AA regular batteries don’t work well and when it does, the lifespan of the battery is a short 2 hours. 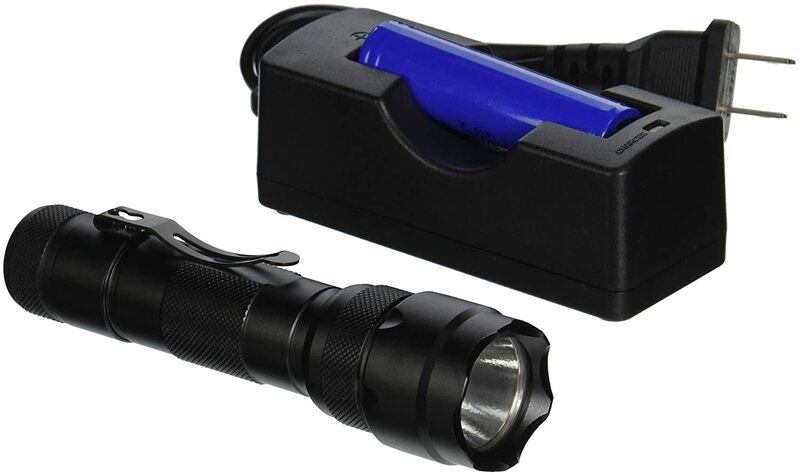 With the lithium or NiMH batteries, the flashlight works well and batteries can last for months. This product first came out in 2011 but has been discontinued by the manufacturer. There is not much you can find out about the manufacturer other than it is located in China and it is better to buy from Amazon than from a Chinese seller simply because of the shipping time which can take up to 3 to 4 weeks from Asia. On top of that, you may have to pay additional customs tax. It’s worth noting that batteries are not included in the box – you’ll have to buy them separately. This flashlight is highly recommended for night sports, camping, and as part of your bike or car tool kit. Its lens is convex and it casing is made of black aluminum alloy. The LED technology is CREE Q5 with power switch on the tail cap. It is capable of reaching a distance of about 100 feet. The performance of the flashlight is excellent. It is slip resistant which makes it good for rainy days or people with sweaty palms. Switching modes or functions is easy and you don’t have to push the tail cap switch hard. If you do, you will shut off the flashlight. It has 3 modes: high, low, and strobe. Since it weighs a mere 65 grams, it’s easy to carry around and performs almost like an expensive Maglite. It has been coined the “Best Flashlight Spotlight” because of its brightness and price. On the other hand, there have been some customers who claim that the lumen is not 300 but most likely at 200 or less. It is possible to mount this flashlight on an Airsoft spring rifle but you will need a few tie straps and electric tape to keep the flashlight from falling off. For other weapons, you can use a mounting bracket and work on customizing the fit. The company does not sell mounting brackets for this flashlight. Overall, it is an excellent piece of equipment. It is handy and has a good beam for night activities. The FordEx Group 300 lm Mini CREE LED flashlight has been getting good reviews. Users have rated it 4.3 stars out of 5, it has been voted top 14 in Amazon’s home improvement products, and #1 in flashlights. If you are looking for a handy flashlight with an intense beam, then this is the one to buy. Not only is it cheap but for the performance it will give you, you will be happy with the beam, zoom, and functions.